Pest description and crop damage Adult moths are small, about 0.12 inch long. The wings are held roof like over the body and are golden bronze with white bands. Eggs are flat, translucent, and laid on the undersides of leaves. The larvae vary in appearance depending on their age, as they progress through five instars. Young larvae are legless and cream-colored. 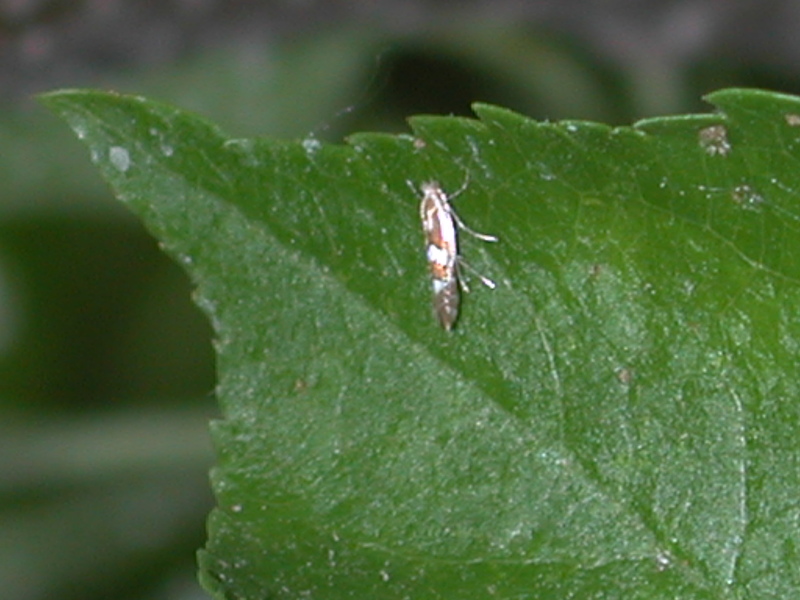 Older instars have legs and are cylindrical in shape, cream-colored and about 0.125 inch long. Mature larvae are yellow and about 0.0625 inch long. The larvae feed within the leaf tissue creating whitish areas on the leaf. Biology and life history This insect overwinters as pupae in fallen leaves. The adults emerge early in the season and lay eggs on the undersides of leaves around the pink stage of flower bud development. Eggs are flat and translucent. The first three instars of larvae are referred to as sap feeders and feed on spongy soft tissue inside the leaves, creating blotches visible only on the undersurface of the leaves. Later instars are called tissue feeders and develop by early to mid-May. These feed on the upper surface of the leaf beneath the epidermis, spinning silken webs to tie the mine together, giving it the characteristic tent-like appearance, visible on the upper leaf surface. Larvae of the first generation then pupate in the leaf. There are three to four overlapping generations per year. Pest monitoring An average of three eggs per leaf is the proposed action threshold. A small parasitic wasp, Pnigalio flavipes, provides sufficient control that insecticides may not be required. imidacloprid-Soil drenches may have residual activity in woody plants lasting for 12 or more months. If short-term management is the goal, consider other approaches. -Highly toxic to bees. methoxyfenozide (met 2F) at 8 to 16 fl oz/a. REI 4 hr. PHI 7 days. Do not apply within 25 ft of aquatic habitat, 150 ft if applied by air. spinetoram (Delegate WG) at 4.5 to 7 oz/a. REI 4 hr. PHI 7 days. Maximum 4 applications per season.